The market is a community of people which interact on a day to day basis. The purpose of their interaction is to buy or sell financial assets in order to make a profit out of price differentials. What any beginning and experienced trader need to understand is that price do not move up and down just randomly or driven by a mysterious force (or an occult conspiracy). The people who sell drive the market down and the people who buy it lift it up. They make the decision to buy or sell based on the view that they over a particular market or equity or any other financial instrument. What is the market sentiment? 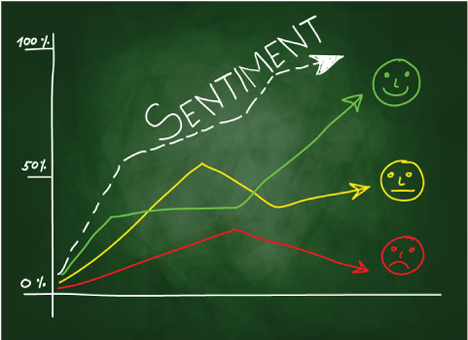 The market sentiment is the overall view that its participants have over a given period of time. The market can’t be moved by a single individual, even though it had a vast sum of money, so the combined force of a certain percentage of market participants is the one that drives prices. Understanding how the other market participants view a certain financial instrument is crucial when trading as it can enable you to anticipate future move and avoid being trapped in the wrong side of the market. By developing skills that can help you examine and determine the market sentiment you will have a highly valuable tool for forex analysis or equity analysis etc. There no use of having tons of knowledge about the markets, trading, risk management etc., if you are not able to apply that information in order to understand how the market works and make good trading decisions. Since the market sentiment can help you determine the overall view of its participants focusing on learning how to read it is essential. To sum up, market sentiment refers to the general view of the majority of a particular market and it also represent one of the key elements a trader should learn how to master, no matter what type of analysis you need(forex analysis or commodity analysis etc.). Learn how to read it and you would be one step ahead in your trading adventure.